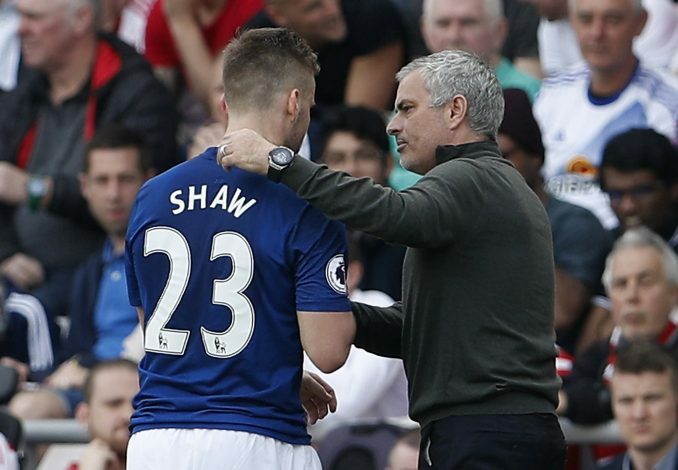 Luke Shaw’s commitment to the Mancunian team was always put under serious assessment by Jose Mourinho. And accordingly, over the last two campaigns, the full-back has been heavily familiarised with the bench, devoid of much chances to operate on the field. Nevertheless, the English international has displayed substantial patience, still waiting for that opportunity to return to first-team action. After being on the sidelines for a major part of the season, there have been minor indications hinting at his return, with Mourinho being momentarily impressed with the left-back. However, even that went down shortly, frustrating the 22-year-old further, owing to the apparent fact that his prospects at Old Trafford wouldn’t be as productive as he’d need it to be. Anyway, according to Le10Sport, the Red Devils are preparing a move for Monaco left-back Djibril Sidibe, evidently a replacement for Shaw, who might decisively break free from the clutches of the Mancunian bench by the subsequent season. Moreover, the ex-Saints man had a severe quarrel with the Portuguese tactician, prompting a plausible move away as soon as the transfer window reopens. With the ex-Chelsea boss believing that the advent of Sidibe would solve the left-back crisis at hand, the supporters might actually witness the move materialising over the summer, perhaps along with another transfer involving Monaco, with Fabinho being one of United’s primary targets.